..:: PreQuimm - Nux Vomica ::..
Synonyms. Latin: Strychnos ligustrina Blume. Spanish: nuez venenosa, nuez vomica. English: Poison nut, Quaker buttons. French: Noix vomique. German: Brechnuss, Krähenauge. Description. An evergreen tree, with a short, crooked, thick trunk, with smooth, ash-colored bark, irregularly branched, the twigs highly polished and deep green. The leaves are opposite, short-petioled, oval, three- to five-veined, shining and smooth on both sides, 4-10 cm long, 2.5-7.5 cm broad. The small, greenish-white flowers appear in the cold season, in small, terminal corymbs. 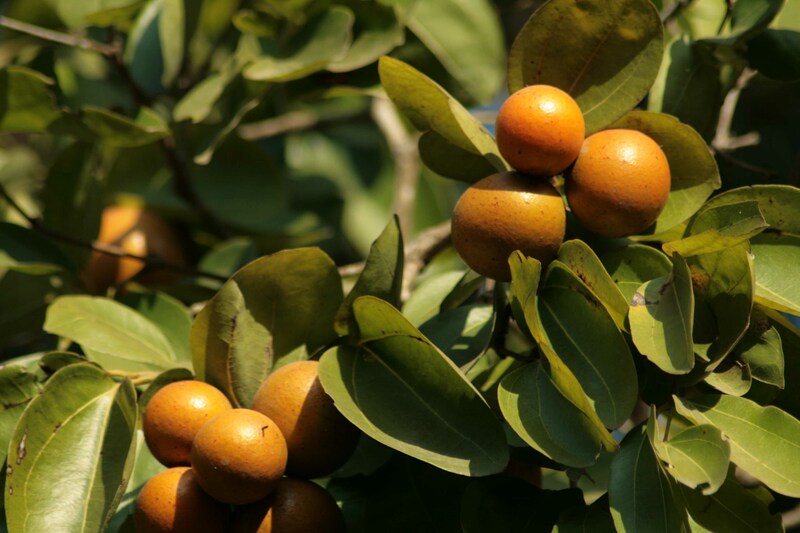 The berry is round, 7-10 cm in diameter, bright orange-colored when ripe, covered with a hard, smooth shell, filled with a soft, bitter, gelatinous pulp, in which the seeds, 1 to 5 in number, are immersed. The seeds are extremely hard, disk-shaped, irregularly orbicular, 2.0-2.5 cm in diameter, 3-5 mm thick, slightly concavo-convex, with a broad, thickened margin, giving a central-depressed appearance. They are grayish-yellow or greenish-gray in color, with a silky sheen due to the appressed hairs radially extending towards the edges, and have an extremely bitter taste. A slightly raised line runs from the navel at the center of one of the flat sides to a cylinder-shaped elevation in the margin that covers the root of the embryo. The embryo is about 7 mm long, with heart-shaped cotyledons 5-6 mm long that extend into the cleft-like circular cavity in the whitish-gray endosperm that forms the main mass of the seed. Habitat. Ceylon and the East Indies.